Kernel-mode request queuing: Requests cause less overhead in context switching, because the kernel forwards requests directly to the correct worker process. If no worker process is available to accept a request, the kernel-mode request queue holds the request until a worker process picks it up. Enhanced stability: When a worker process fails, service is not interrupted; the failure is undetectable by the user because the kernel queues the requests while the WWW service starts a new worker process for that application pool. Embedded SSL process, when secure HTTPS communication is needed. Inside http.sys all the magic is made... it will listen to any incoming connection request, then handle the headers, then check against any matching URL and handle all the communication by itself, leaving the server threads free to process the next request. We use a special feature of http.sys to serve a file content as fast as possible. In fact, UnityBase just sad to http.sys to transfer file and whole file access and sending will occur in background, at the kernel level, so with best performance. 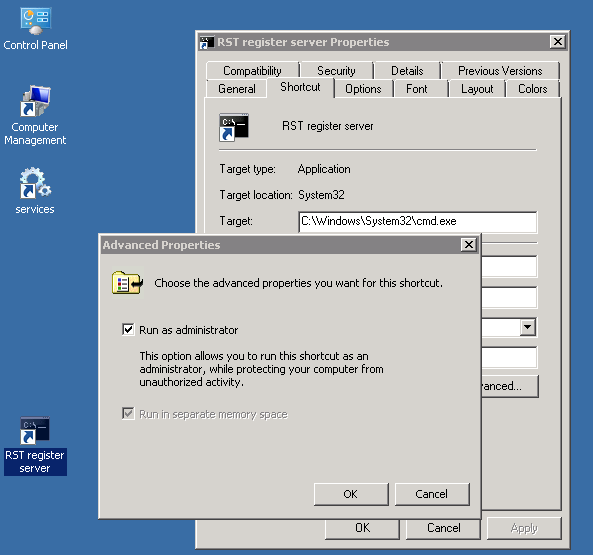 Standard security policy, as requested by Windows for all its http.sys based systems (i.e. IIS and WCF services) is to explicitly register the URI. Depending on the system it runs on (i.e. Windows XP or Vista and up), a diverse command line tool is to be used. To keep it simple, UnityBase provides a dedicated command line options to requester a particular URI prefix depending on current server configuration. command will add / remove UnityBase server URI to http.sys routing table using current server configuration parameters. The http.sys kernel mode server can be defined to serve HTTPS secure content, i.e. the SSL protocol over HTTP. When the httpServer.protocol boolean parameter is set to "true" in server config, the SSL layer will be enabled within http.sys. Note that "Socket" kind of server does not offer SSL encryption yet. By default only SSL 2.0 are enabled in Windows. This protocol is not secure enought in modern world, so we recommend to disable SSL 2.0 and enable TLS 1.2 instead. See TLS/SSL Settings article for details. You need one certificate (cert) to act as your root authority, and one to act as the actual certificate to be used for the SSL, which needs to be signed by your root authority. If you don't set up the root authority your single certificate won't be trusted, and you will start to discover this through a series of extremely annoying exceptions, long after the fact. Take a look at the above links to see what each of these arguments mean, it isn't terribly important, but it's nice to know. The MakeCert tool is available as part of the Windows SDK, which you can download here. If you do not want to download the whole Visual Studio package. Membership in Administrators, or equivalent, on the local computer is the minimum required to complete this procedure. drag and drop works happily. Note that you are using the first certificate as the author for this latest one. This is important... where I have localhost you need to put the DNS name of your box. In other words, if you deploy your service such that its endpoint reads http://bob:10010/Service then the name needs to be bob. In addition, you are going to need to do this for each host you need to run as (yes, so one for bob and another one for localhost). Get the signature of your cert by double clicking on the cert (Select the Certificates (Local Computer) ' Personal ' Certificates), opening the details tab, and scrolling down to the "Thumbprint" option. Select the thumbprint and copy it. Put it in Notepad or any other text editor and replace the spaces with nothing. Keep this thumbprint heaxdecimal value safe, since we will need it soon. You have your certs set up. Congrats! But we are not finished yet. Now you get to use another fun tool, httpcfg (for XP/2003), or its newer version, named aka netsh http (for Vista/Seven/Eight). If this is your first time doing this, it should just return a newline. If there is already SSL set up on the exact IP you want to use (or if later on you need to delete any mistakes) you can use the following command, where the IP and the port are displayed as a result from the previous query. Here the appid= parameter is a GUID that can be used to identify the owning application. Note that this is mandatory to first delete an existing certificate for a given port before replacing it with a new one. Generated by JSDoc 3.4.0 on Thu Jul 28 2016 11:09:57 GMT+0300 (FLE Daylight Time) using the ub-jsdoc theme.